Are you looking for a way to use Word automation? Want to deal with Word documents programmatically? Go through this tip, it will help you to deal with Word Automation without Interop using C# and OpenXML. Now a days, DOCX files are getting popular day by day, due to them being very light and faster in processing, DOCX is the magical result of ZIP and XML combination. So it is clear that if we able to manage XMLs, we will be able to manage DOCX too. For managing WordXML, we need some API and that API is known as Open XML SDK for Microsoft Office, MSDN Says "API simplifies the task of manipulating Open XML packages and the underlying Open XML schema elements within a package. The Open XML SDK encapsulates many common tasks that developers perform on Open XML packages, so that you can perform complex operations with just a few lines of code." Do you know you can unzip DOCX file? DOCX is the combination of several well structured .XML file, An Open XML file is stored in a ZIP archive for packaging and compression. You can view the structure of any Open XML file using a ZIP viewer, Open XML document is built of multiple document parts. The relationships between the parts are themselves stored in document parts, each typical DOCX file has the following different parts. Body is the main part of the document and it has many different parts as shown in the above figure. element, Paragraph different sub elements like ParagraphProperties (Optional), Run and Text. The run element is provided to demarcate a region of text. The OXML SDK Run class represents the element. This element contains actual Text of a document, With the <r> element, the text (<t>) element is the container for the text that makes up the document content. Open Visual Studio and start with the first OpenXML assignment. Create new Project/Application and add DLL reference (DLL should exist in Installed OpenXML API folder, e.g., C:\Program Files\Open XML SDK\V2.0\lib). 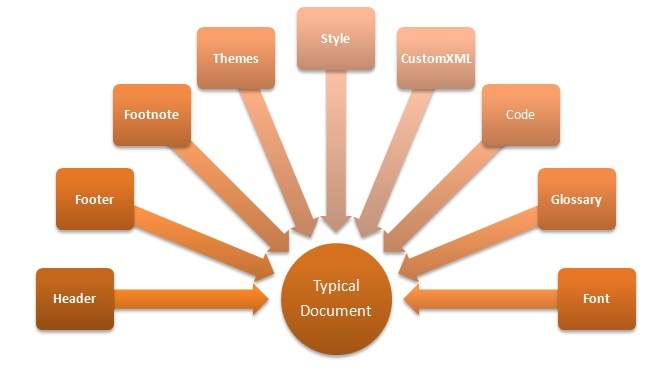 See the below snippet where we are creating new Word document with the help of OpenXML. That's it. No need to save document anymore. Now if you go and check for 'test11.docx', then you can see it contains text 'New text in document'. Now try to unzip that Docx file, you will get below folder structure, you will get folders _rels, docsProps, word and [Content_Types].xml file. In the above image, you can see <w:body> represents MainBody of the document, <w:p> is the paragraph element, <w:r> is the run element, <w:t> is the text element. This is how OpenXML works. OpenXML is really an amazing thing, it fluently works with spreadsheets, charts, presentations, and Word processing documents. The Open XML file formats are useful for developers because they use an open standard and are based on well-known technologies: ZIP and XML. OpenXML is not a single cup of tea, I am continuing with a different assignment on OpenXML in the next version of this article. Till then, enjoy this stuff. Suggestions and queries are always welcome.